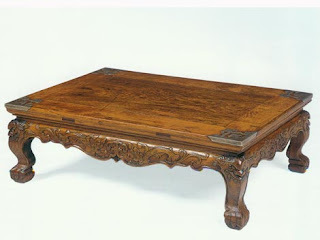 The tea table (chaji) was a new furniture form introduced and popularized after the end of the Ming dynasty. Incense stands are illustrated in some Ming paintings, and they were used to hold handscrolls, albums, fruit plates, teapots, censers and religious objects. In the Qing the tea table seldom stands alone. It is smaller and slightly lower than the incense stand, and is usually placed between a pair of armchairs on each side of the main hall. A tea table of medium size could also be used as an incense stand.